A healthy diet menu is a list of balanced nutritious foods with levels that are adjusted to the needs of the body every day. This menu is not only reserved for those who want to manage the body, but for everyone who wants to live a healthy life. To get the maximum benefit, your healthy diet menu must contain a variety of essential nutrients that are needed by the body. Essential nutrients are nutrients that cannot be produced by the body, so they must be fulfilled by consuming foods that contain these nutrients. Carbohydrates, proteins and fats. Whereas micronutrients are nutrients that support the body's performance, and enough to be consumed in small quantities. Which include micronutrients are vitamins and minerals. Every day, the body needs to be given an intake consisting of carbohydrates, proteins, fats, various vitamins and minerals, and water to support its performance. The body's main energy source comes from carbohydrates. The brain can also work optimally if you get this intake adequately. Examples of good carbohydrates are foods made from whole grains, vegetables, fruits, and nuts. Carbohydrates that you have to limit consumption include white rice, packaged fruit drinks, soft drinks, potato chips, sweets and sweet cakes. This substance is a source of energy for the body. Adequate protein intake, is very important for the growth of body tissues, helps maintain a healthy body, and helps the body heal itself. Protein can be found in eggs, fish, meat, soybeans, poultry meat, cheese, and nuts. You might avoid it if there are foods that contain fat. However, fatty foods do not always have to be avoided. The body also needs fat intake to maintain cell structure and help the body's tissues function properly, maintain the immune system, and help the body absorb vitamins. Even so, you must know the limits in eating fatty foods so does not cause weight gain, and does not increase the risk of heart disease and other health problems. Choose good fatty foods, such as fish, lean poultry meat, vegetable oil (olive oil). Limit fatty foods such as pizza, burgers, sausages, and fast food, because high in saturated fat. These two substances can help the body's organs in carrying out their functions . Vitamins that are needed by the body are vitamins A, B, C, D, E, and K. While the minerals needed by the body include calcium, iron, potassium, zinc, and selenium. The liquid does not have nutrients, but water can hydrate the body. About half of your body composition consists of water. Aside from drinking water, you can get liquids from foods such as fruits and vegetables. All of the above can be found when you run a healthy diet. In addition to paying attention to the nutritional value, foods that must be on a healthy diet should also be adjusted to your daily calorie needs. Each individual has different caloric needs. However, the average adult needs 2000 calories per day. Consult a nutritionist so you can find out the number of calories that are suitable for your body condition, including age, gender, daily physical activity, metabolism, height and weight, and certain health conditions. Eating based on calorie needs is very important, especially for those of you who want to lose or maintain weight. Calories can make your body energize. However, consuming calories more than the body's needs can make it accumulate in the body and be stored as fat. Here's a healthy 2000-calorie diet menu that you can apply for breakfast, lunch and dinner. Although called a healthy diet menu, your tongue can still be spoiled by variations of this food. You can fill your stomach by eating a bowl of cereal with a sprinkling of raisins and fat-free milk. After that, one small banana and one sheet of bread from whole grains ( whole grain ) with a spread of margarine and jam you can eat. Other healthy breakfast choices are oatmeal mixed with raisins and cooked with margarine. For drinks, you can drink orange juice (250 ml) and nonfat milk (120 ml). You can make sandwiches consisting of bread from seeds whole, chicken, lettuce, sauteed mushrooms, and mustard sauce. End your lunch with 200 grams of boiled potatoes. Tofu with vegetables and peppers, a bowl of brown rice and one cup of lemon tea about 250 ml. Other dinner variations that you can try are 140 grams of grilled salmon sprinkled with celery leaves, onions, and bread crumbs. Serve with rice, 125 grams of steamed broccoli, and almonds. End the dinner with non-fat milk (250 ml). 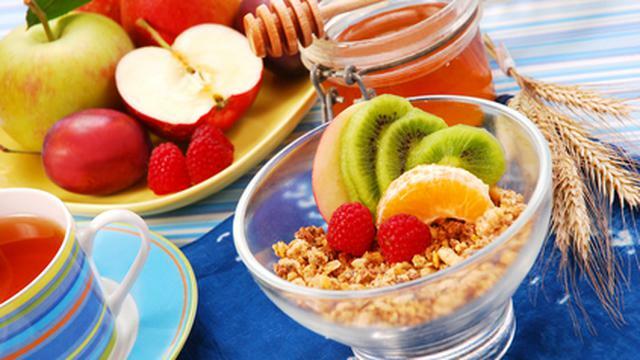 Examples of snacks you can consume every day consist of 250 grams of low-fat yogurt mixed with fruits. There may be times when you get bored with healthy food and want to eat foods with high fat and calorie content, such as fast food. You can consume it on certain days, for example every Sunday. However, the next day, you have to eat foods that are low in calories to avoid accumulating calories in the body. Applying a healthy diet menu will be more helpful if you exercise regularly, at least 30 minutes per day, in order to maintain a healthy body.